2 patterns = 6 skirts. 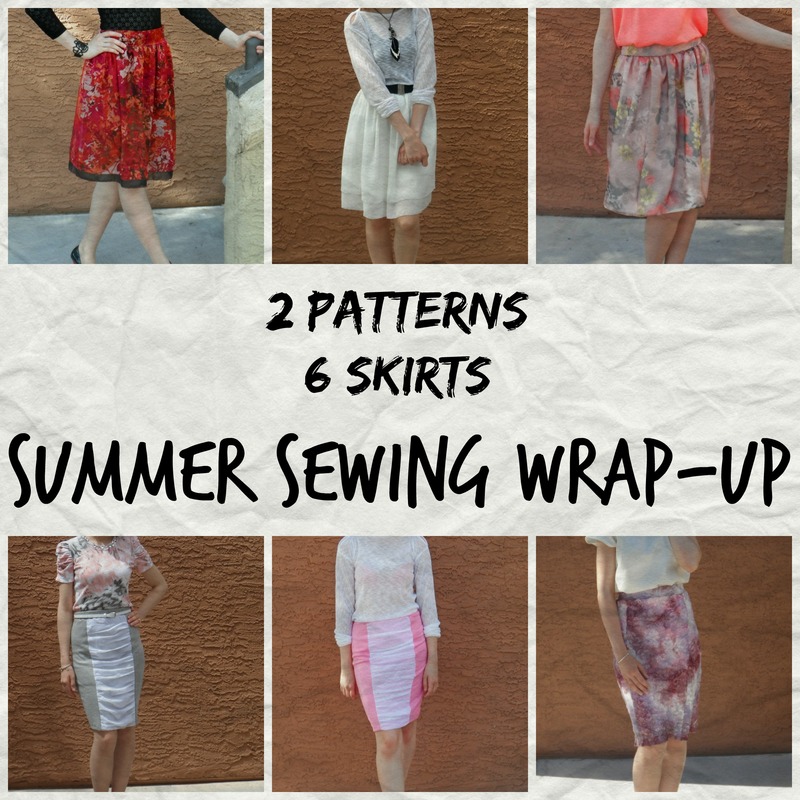 Summer sewing wrap-up – Go ask Alisa – DIY capsule wardrobe one stitch at a time! Let’s do a quick summer sewing wrap-up, because as of right now I am entering the phase of “sewing business casual” style, so I can officially say I am almost done with summer sewing! As many of you know – I love reusing my patterns. Especially if that’s the one I love, the one that fits my body perfectly – why not put this pattern in use one more time? I just realized that I used only 2 patterns to make 6 skirt and believe me – I am perfectly happy with that. So, take a look at the skirts below – I hope you like what you see. Read one and find out what patterns I used, what fabrics I chose and how did it all come together. Red & black Tango skirt – I chose 100% silk and doubled it with a layer of black chiffon, with invisible zipper at the back. Simple yet elegant I should say. Made it in roughly 3 hours, also while baking some home goods. Multitasking. I hope you enjoy the style and the flair of this skirt! Layered chiffon skirt – Okay, this is a simple yet quite sophisticated combo: layered chiffon skirt and knit sweater with interesting shoulder detail. You can wear it with a matching bra, or as I did – with a contrasting tank top underneath. I also made a “Mono” necklace. Also, here’s another outfit that used the same patterns. Gathered Floral skirt – Easy breezy pattern, wonderful fabric print, amazing feeling of colors – what could be better for those summer days? Especially here, in Vegas. The deal with me is that if I found myself in love with certain pattern, I am probably going to make two or three, or maybe more, different takes and styles on it. My signature style skirt – My signature style for years has been: gentle, feminine and hand-made. I was making hand-made items since I was about 12 or so. I really do enjoy that, it is what brings joy to me: mulling over ideas, creating unique pieces that only I have. I love to wear skirts and I like to keep it interesting. All clothing that I create should be comfortable, easy to wear and presentable. Soft blush skirt – I fell in love with pretty much every single detail of this skirt, on the picture original skirt was made all in white but it seemed to be like an overload of white… So, I was lucky to find this nice, thick pink knit jersey at remnant sales in Jo Ann’s and then the white ruched insert is all chiffon. This pattern really does not take too many of materials. I omitted the zipper since it is jersey and added wider band at the top where I inserted elasticated band. Valentino inspired lace skirt – I believe most of you, sewing bees, are familiar with the feeling of wild excitement when you have a piece of beautiful fabric on your hands and a dress pattern you dreamed of! Read on about this amazing lace skirt and how I made it! So smart and pretty. I’m using your post for inspiration for when (if) I get another job. Next Next post: Sewing business casual: all dressed up in navy blue!